Ocean View, 3-Patio, 6BR, 6300sf Home w/Pool; 50 Steps to Beach, Coligny Circle! “Drake's Beach House” is a magnificent 6300 SF, 6 bedroom and 6.5 bath home in North Forest Beach. Located less than 50 steps away from the beach, this is the ideal home for your next vacation! -Main Level: An entertainment-focused 26x20 living area with an Italian-tiled floor, sectional sofa, 4-seat, bar-height dining table, TV, and fireplace; A wet bar, and a full size refrigerator; 3 over-sized bedrooms with private bathrooms and closets; Bedroom configurations are: 1 King, 2 Queens, 1 King; Outdoor access through two large, glass patio doors that overlook the covered patio, pool and hot tub; garage access to 2 car stalls. Kitchen: Granite counter tops and tile floors with an eat-at breakfast bar with 4 bar stools; Appliances finished in brushed steel, double oven and counter microwave to service the large dinners; toaster oven, full refrigerator with ice maker; Over-sized work island, generous counter space for cooking prep and 21x15 large space…because everyone gathers in the kitchen! Kitchen is stocked with cups, plates, silverware, bake ware, pots and pans, knives, and most anything you would need to cook a meal or bake in home. If you have specific needs for cooking, ask us to confirm that we do or do not have it. Dining Room: 20x13 room convenient to the kitchen with ten seats and a large family-meal table. Dining room is viewable from the family room, yet offers somewhat private dining for those that want to be out of the kitchen and family room areas. Bedroom 6: We designed this room for the kids. It is a massive 30x25 room featuring 1 queen, 2 twins, and a queen sleeper sofa; It has ocean views, a walk-in closet, plus a bathroom with shower. Our kids love this room and refer to it as the “Dolphin Lookout”! Whether relaxing in one of the generous bedrooms, watching a sunrise on the patio, making a splash at the pool, or having a blast at the beach, you’ll enjoy the opportunity to make this home part of your Hilton Head vacation to create memories for years to come. We have enjoyed renting this home out to many repeat guests over the years. We look forward to having you as a guest in our home! We live in Carmel, Indiana. We look forward to our spring and fall vacation every year at Drake's Beach House. We've made so many wonderful memories here. We trust you will, too! We have been vacationing in Hilton Head Island every year since 1997. Our family purchased the home at North Forest Beach iin 2002 because of the location. 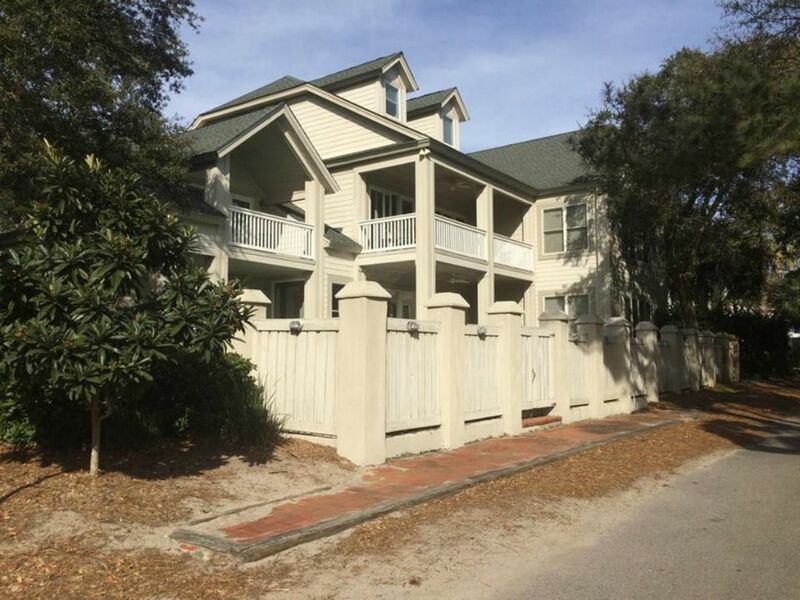 We are less than 50 steps away from the beach and only a three-minute walk to Coligny Circle. It's also a golfers' heaven with more than 20 top golf courses within 10 miles of the home. This truly is our second home and we know you'll enjoy it as much as we do! You will love the private beach access, quiet setting, and convenient walking or biking access to almost everything. This home's open layout and over-sized bedrooms and living areas welcomes groups of all sizes. We listed the size of each room and sleeping arrangements so you can see how it will meet your group's needs. Each bedroom has its own private bath, making this home an excellent choice for groups, both large and small. You can choose outdoor living at the beach or pool, city nightlife, dining, and shopping,just a short walk from the home, or enjoy a book or movie in a quiet spot in the home. This home was built to meet everyone's needs! 2nd Row. 30 feet from beach. 50' TV in 2nd floor living area. All bedrooms have T.Vs. Large, open living layout; Very easy for users to get away for a private retreat in many spaces in the home, even with a full house; 50 steps to the beach; Very family friendly and comfortable home to stay in. We're excited to have you as a guest! The house is so spacious and you couldn't ask for a better location. My parents, my sisters, myself and all of our families stayed and had plenty of room and one of the best vacation weeks ever. We highly recommend and hope to book this house again in the future! The inside of this house is immaculate. We had our live-in maid along so that it became the equivalent of a 5 Star Hotel. people.It meant we had to leave one of the pool doors unlocked for our entire stay. All of the accessories for the beach (beach chairs, tent, tubes) are in the garage. The house has the new 5G internet. You will not find a more spacious house. The house was very clean. Rooms were large. Smoke detector missing in mid level floor . We had an enjoyable family fun week at the beach. Great week at the beach!!! Location is perfect...one house back from beach and five minute walk to Caligny!!! We had 15 adults and we had plenty of room to spread out....rooms are spacious! Didn’t give five stars because some attention to a few things needed. Owner was easy to reach and responsive. Being near the beach and town was perfect. Couldn’t have asked for a better stay. So glad you had a wonderful time! Thank you for the review. Looking forward to having you as my guests in the future. I treated my family to a Mother's Day escape to Hilton Head and rented the Drake House. It fit our needs perfectly! The two living areas worked well with 2 small grandchildren having a quiet space for them in the mornings and another living space for the older grandchildren who like to sleep in. There were a few minor problems that we noticed upon our arrival but Mindy and Pat took care of them very quickly. Pat even called us to make sure everything was to our satisfaction. I hope to rent from them again!